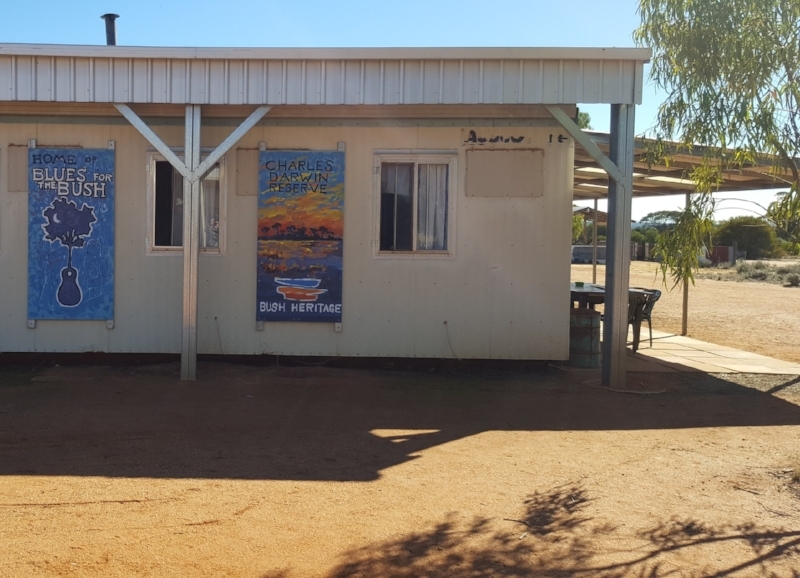 Following up on a contact from the 2017 Perenjori Agricultural Fair with Bush Heritage Western Australia, a few of us visited the Charles Darwin Reserve owned by Bush Heritage. It is a 68,000 hectare reserve that use to be a pastoral lease and has been bought for conservation by Bush Heritage. I thought it would be a fantasic place to visit and also scout for potential future research sites as this reserve is not surrounded by agricultural fields (like all the other reserves we work within). Our first stop was to check in with the site manager, Will Hansen, who lives with his family out on the reserve. We sunscreened and watered up at the living quaters (above) which also displayed some awesome artwork for the reserve and the Blues of the Bush (which is held in the reserve every other year). We were given a map of the reserve with the walking and driving tracks on it and then we were ready to start our adventure. At the start of the day, Abigail Pastore (the Mayfield Lab postdoc) and James Hagan (a visiting Masters student to the Mayfield Lab) enjoyed a bit of bird watching! Then we came across a large Hakea (?) bush that had many pollinators including various species of bees, wasps, flys, and beetles. We hopped in the car and on one of the tracks we stopped and searched for a marked gnamma hole. These are holes that were shaped and used by the traditional aboriginal land owners as watering holes on journeys. They would put sticks (such as those above) in the watering hole to provide escapes for any unsuspecting creature that fell in (so that they would not die and putrid the water. We saw little wildlife about other than birds. We caught a picture of this pretty lizard as well as a glimpse of a kangaroo. What I really wanted to see were wild emus... but alas I saw only some tracks (below). Overall this is a fantastic reserve full of cultural and ecological diversity. I was elated to get the chance to visit and I look forward to visiting again as well as potentially getting the opportunity to do some research within the reserve as well. For more information on the reserve take a gander at this site.